Ingredient info:Elephant garlic, available at better supermarkets looks like garlic that’s been supersized. 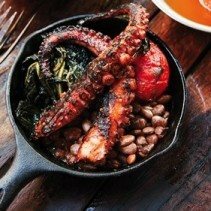 Place octopus and wine in a large pot. Peel 2 garlic cloves; add to pot. Add enough water to cover by 2″. Bring to a boil, reduce heat to medium, and simmer until octopus is tender, about 1 hour. Transfer to a plate; let cool. Cut octopus into 4″ pieces. Remove as much of slippery outer purple coating as possible without removing suction cups. Thanks to Epicurious.com for this recipe.